A book by former Treasury secretary Tim Geithner, who served four years as one of President Obama's key crisis counselors, will be officially released next week. Dozens of books have been written about how the federal government handled the financial crisis, housing meltdown and economic collapse. Now Tim Geithner, who served as Treasury secretary throughout President Obama's first four years in office, is giving his insider account as a crisis consigliere. His book, "Stress Test: Reflections on Financial Crises," is due out officially this week. 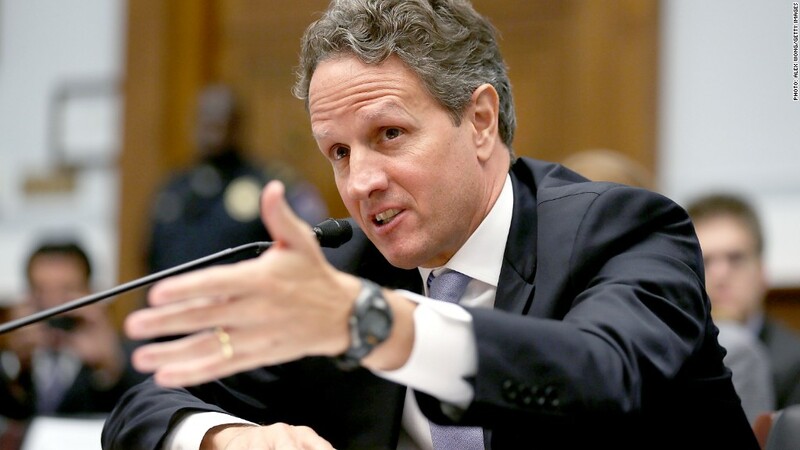 Geithner, 52, was president of the influential New York branch of the Federal Reserve in 2008 when the collapse in American home prices and spurt of foreclosures started to ripple through the financial system. He worked closely with Treasury Secretary Hank Paulson and Federal Reserve chief Ben Bernanke in making some of the earliest -- and most controversial -- decisions. They decided not to rescue investment bank Lehman Brothers -- but days later, they bailed out global insurance company AIG. Then came the Troubled Asset Relief Program, the $700 billion program aimed at rescuing banks that were seizing up as bad loans cascaded through the system. TARP, signed into law by President George W. Bush, became a symbol for government's response. By the time of Obama's historic election in November, things just kept getting worse. The foundations under the financial system were collapsing, companies were jettisoning workers, and the American auto industry was in a tailspin. At a perilous time, Obama sought experienced hands to form his economic team. Geithner never worked at a bank but was a familiar figure on Wall Street, which welcomed his selection. The day word leaked that Obama would name him to lead Treasury, the Dow gained nearly 500 points. In an interview, Geithner told the New York Times that he didn't even want to be Treasury secretary, but that Obama persisted. Geithner was sworn in as the 75th Treasury secretary in January 2009. His road to confirmation wasn't entirely smooth -- he was dinged in particular for failing to pay taxes. And once he took the post, the challenges were numerous. The U.S. economy was in rough shape, and cracks were showing in Europe, too. There were clashes with lawmakers who charged that TARP funds were handed out with little accountability and that executives at bailed out banks took home huge bonuses. Critics on the right said Obama and Geithner were hijacking the private sector, while progressives blasted them for focusing on Wall Street at the expense of Main Street. Inside Washington, Geithner butted heads with TARP watchdogs Elizabeth Warren and Neil Barofsky. Neither portrayed Geithner favorably in their own books and Barofsky wrote of outright hostility. Under Geithner, the administration and Congress passed the Wall Street reform legislation known as Dodd-Frank. In 2011, a standoff between Obama and congressional Republicans over the debt limit ended with the U.S. credit rating being downgraded for the first time. Geithner spent a rough four years in office, and he tried to leave after two. Obama asked Geithner to stay on through the first term and reportedly made his case to Geithner's wife, Carole, on a private walk of the White House grounds. Throughout the crisis, Geithner defended his moves as necessary tactics to prevent an even deeper financial collapse. "Financial crises are perilous, and this one won't be the last," he wrote in promotional materials for the book. "Yet the United States has no standing army for fighting financial wars, no Joint Chiefs of Staff, no War College. ... There are lessons to learn from this extreme one that can help policy makers and the public during the next one. I hope this story can help illuminate these lessons." The title of Geithner's book comes from the stress tests that regulators designed to evaluate a bank's ability to withstand dire economic conditions. The 2009 tests are credited by many as having helped stem the financial bleeding in the banking system. Today, Geithner -- after spending virtually his entire career working for the government, works in the private sector. He started in March as president and managing director at the private equity firm Warburg Pincus.